More than five decades of experience in designing and building experimental facilities has allowed us to catalog an extensive library of arrangements that can be applied to new situations. Our goal is to provide you with a fully functional test section that can be used immediately after the wind tunnel is installed. The test section is the most important part of any wind tunnel because it’s the area where all of the work is performed. The remainder of the tunnel is, in essence, a set of well designed HVAC ducts guiding the airstream to this one critical area. 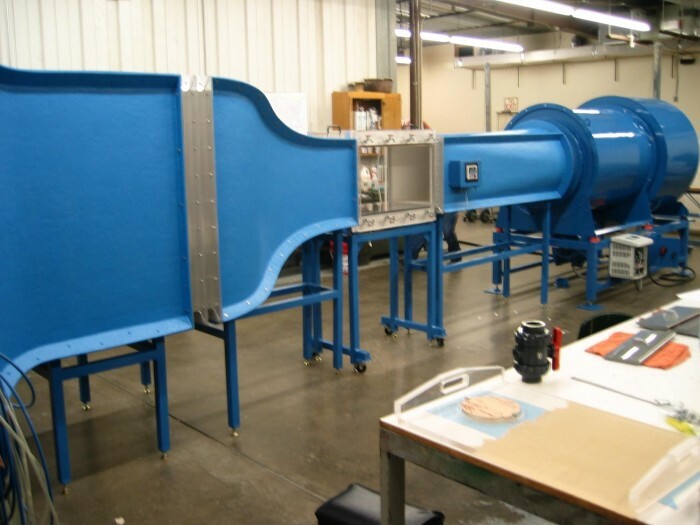 We design and fabricate wind tunnels of every imaginable configuration, including standard sized units that you can choose from or modify to fit your research, experiment, educational and demonstration needs; as well as open circuit and re-circulating configurations of many different flow rates and cross sectional test areas. Diverging ceiling and floor panels or sidewalls to account for the boundary layer growth through the test section. Hinged windows supported by gas springs for easy access to the model under test. Recessed panels for customer test jigs. Removable floor section(s) for inserting floor strut balances. Two dimensional (either X-Y or Y-Z) or three dimensional traversing systems arranged for manual or stepper motor control, plus offset false surfaces for boundary layer work. Boundary layer suction on any combination of surfaces. The test section available with our standard designs incorporates a removable ceiling secured with quick release fasteners. If desired, the floor can also be removable, or the arrangement can be rotated 90°, enabling one or both sidewalls to be removable. A limited number of ports (up to 15.2 cm [6"]) in diameter is standard. Up to 30.5 cm (12" can be supplied) can be machined in any of the test section surfaces. Flanged acrylic plugs close the ports during operation. If your projects include either LDA or PIV work and the refraction angle or the non-flatness of the acrylic surfaces introduces undesired optical effects, we can incorporate optical-quality flat glass into an appropriate side of the test section. Our standard-sized wind tunnels meet many needs. They can also be modified to fit your specific research, experiment, educational and demonstration requirements. 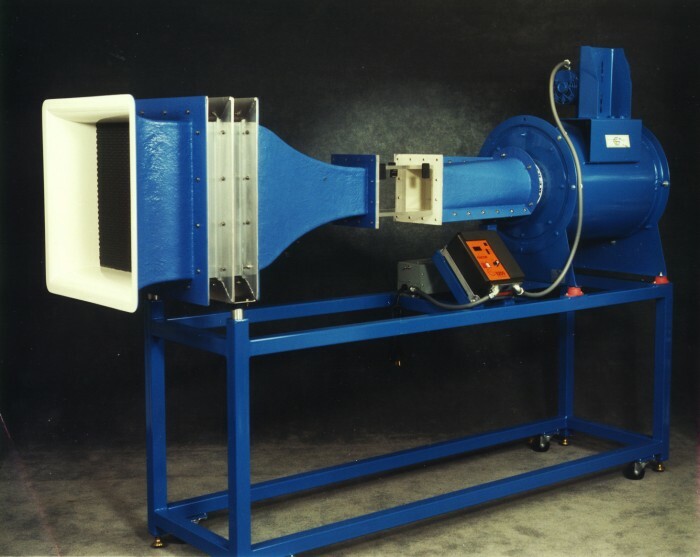 We fabricate electronic cooling wind tunnels that feature low turbulence, uniform flow, easy operation and versatile test sections. We offer a complete system of models and measurement systems as an add-on option to any ELD wind tunnel. This full instrumentation system, offered as an accessory to the standard wind tunnel models, allows students to investigate and measure the basic air flow phenomena and make the association between theoretical concepts and real life events. This system can be adapted to any sub-sonic wind tunnel or other application for similar air flow measurements. In situations requiring more refined measurements, we will help you establish the measurement type and accuracy. We have a strong working relationship with a wide variety of instrumentation vendors, and can procure required components or suggest other vendors for you to pursue independently. 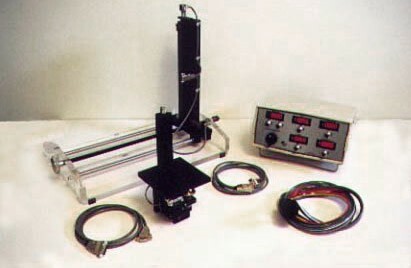 A lift-drag dynamometer, pressure transducer, and two-axis probe positioning system. The pressure transducer can be used to measure the pressure distribution associated with wind tunnel models and/or for measuring the test section velocity when used in conjunction with the Pitot-static probe. Linear differential variable transducers (LVDTs) are employed for sensing loads on the dynamometer. The LVDT provides a remarkably stable output signal and will withstand rough handling. The probe location is reported through the separate digital displays. All of the necessary electronics are included in an attractive, bench top enclosure.